"David B. brings a playful, erudite approach to both text and artwork and, in the process, has created one of the most unusual, fascinating graphic novels I've ever seen. I can't praise this book highly enough." "It's beautiful work, a career highlight among an exceptional bibliography." "4 out of 5 stars. An intriguing take." "Gorgeous and captivating from start to finish." "Bold, vivid and graphically mesmerizing, this enthralling progression of history, myth and imagination is a wry and loving examination of the act of telling stories." 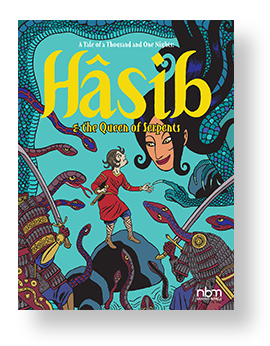 " In using the medium of comics, the story of "Hasib and the Queen of Serpents" comes as close to the oral means in which it was originally told...We often look at such stories as being "for children," but when we see them presented in such a manner, it is obvious that they are truly art and worthy of recognition as such." "Using colors like the inks used for dyeing Persian rugs, lavish blues and reds… as unlikely as it is wildly unpredictable... It's a page turner and Hasib never slows down."